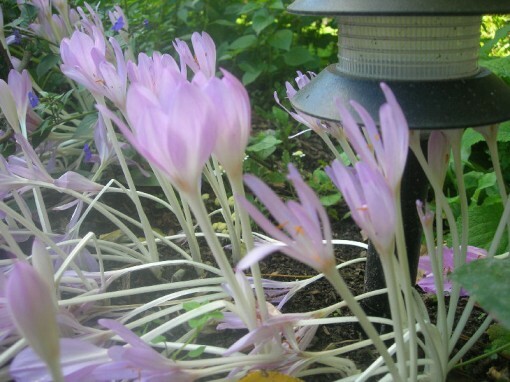 As befits a good garden buddy, I gave some colchicum bulbs to my friend Bub several years ago. As a matter of fact, every time I dig up and divide a new kind, I give her some, so by now she has at least three kinds. But she’s never bought any herself, so all that she has originally came from me. The strange thing is, she now has a type that I don’t have. In the photo above, the wider petaled flower in the upper left is what I would call Colchicum byzantinum. 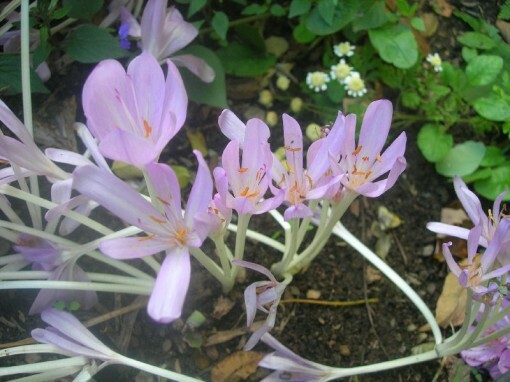 In the middle you can see some intermediate width petals, and all the way to the right, some really skinny-petaled blossoms. Below is a second photo which, while slightly out of focus, makes the petal difference quite clear. I don’t know what to think. She lives a mile and a half away–could the cultural conditions be that different? Is it a new hybrid? A common variation? Anyone who has some insight into the puzzle, please enlighten us all in the comments.